The first part of both Kotor games are super slow and take forever. Once you get off Taris in the first game it's a lot more fun, plus just getting to know all the characters and Revans back story is worth it. With the big battles on the star forge with multiple spawning and attacking enemies with game pausing on each new target, the game can crash - just save often. I play on xbox/xb360 and xbone and it only crashed a couple of times for me - never on xbone. Its a shame though - I wish they would add the dlc to xbone. I miss the cyan blue saber crystal and the orange. The crashes happen during the cutscenes and not during game play, so trying to get star forge to load took a couple tries. I just started the unknown world before the star forge. Seems like I get settled down to play, something else demands my attention, so I don't get very far anyways. The iOS KOTOR game is meh. Where’s the one people think is good? So now we have Juhani & Carth confirmed coming to SWGOH - I bet the Ebon Hawk (ship) and Darth Malak & Darth Revan are not far behind - lets not forget an HK47 update (at least his Old Republic tag). We did need 2 more characters for Darth Revan. Not sure how they could swing those two for a DS Revan. I'm thinking a Malak legendary or marquee (if so, marque++ like Jango). Then you'd have him as lead with DS Bastila, Canderous, HK47, and Juhani (who flirted with the DS). It would have made more sense to have gotten DS Revan first, unless the LS Revan we have is pre-mandolorian wars (and thus pre-KOTOR). Then we might need LS Revan for DS Revan. Trouble with that theory is that most of the OR characters appear post-mandolorian war, so you’re left with Malak, Bastilla, and Carth, the only 3 that could have known him in that LS period. I suppose HK could come in near the end when he's starting to fall. The difficulty lies with the fact that Revan being light or dark side is player choice, so there is no set solid path. The gameplay is dated because the game is dated ... 2003. And it's an RPG, so conversations are kind of the expectation there Normally you get off Taris by about level 7-8. If you don't like older games, RPGs, or SW, then I agree -- it's a pass. My love of SW is driving me for sure. I can't stand all the talking, more blasting and indiscriminate lightsaber swinging please! Although I am walking the path of the Jedi, so diplomat it is. Where abouts in the game are you now? Finished Kashyyyk and went to Manaan. So Tatooine down, Dantooine finish, Kashyyyk liberated. Wait, you're supposed to do Kashyyyk before Manaan? Maybe that's why I'm having a hard time with Manaan. I downloaded KOTOR quite a few months ago when I saw it was on there. Played it until I got stuck. I'm sneaking into a base and there is a part where there are like 6 guys and I have no way to take them all out on my own, so I die every time. I got arrested, put on trial, and executed. The nerve. I usually do as much of Dantooine as possible, then Tatooine, then Manaan. The sith base is the difficult part. I find it helps to have Bastila or Juhani with crowd control abilities (horror, whirlwind, etc) so you can pick off the crowds, and destroy droid as well. 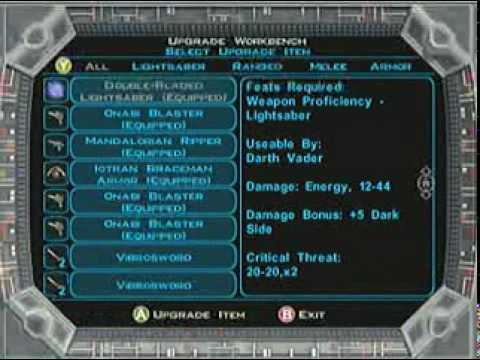 Your main Jedi Melee character should have Knight's speed (or close) while your backup Jedi should have Force Valor to buff everyone - you'll need that for the end boss at the base. Haha not my fault the game forces you to sneak into the base. Can't progress without it. You need to find the brain washed Selkath and convince them to leave - it then proves in court that the Sith were corrupting the Selkath youth, and they let you go. Before Disney came along, KOTOR was not "Legend" and its cannon was Revan goes dark as Darth Revan and then is redeemed through the events of the game - just like what you are playing now. Therefore he was both Light and Dark in cannon. The game certainly calls for Darth Revan...and we will get him. I think Malak will likely be a special marquee event and of course he will have a leader ability as he wasw the main antagonist in KOTOR and leader of the sith. Perhaps he may be released with another Old Republic toon - who that is, I do not know. * and the extra character who could be released alongside Malak...perhaps a Sith Soldier or something? Anyways, who knows at this point, but we do know Darth Revan and Darth Malak will eventually make their way to the holotables. So I got a chance to play again, I made it up to the battle with Malek. KotOR has been a fun game. So much fun that I bought KotOR 2 for myself for Christmas and it is currently on its way. I should finish that final battle when I get home tonight. Beat that evil Sith Lord into submission! Then have fun against the Sith Triumvirat!!! KOTOR 2 is a great story as well. Its a shame the series falls short when it turns to SWTOR. They should have finished the "Revan Story" in its own trilogy and made SWOTOR separate for the masses who actually enjoy MMO games. I finished KotOR 1 and have installed and am working on the intro, which is a cool set up btw. Is there a patch or an update or something I should be looking for for my KotOR 2 quest? I think there is some deleted content mods out there, but I've always played on console - so no access to such things for me. I think I found one. downloading now. There are mods out there for kotor 2 that add a lot of content that was scrapped due to having to release the game before it was ready. I haven't played it with the mods though. You are looking for TSLRCM (The Sith Lords Restored Content Mod). Adds a lot of stuff. Big download but worthwhile to patch stuff that is obviously missing when you reach certain points. I probably wont do so either, I was making sure that I was covered. I know people told me to get a patch for KotOR 1 and wanted to make sure 2 wasnt the same. I will keep that in mind. Normally I prefer a clean play the first time, then I go for cheats. Feels more authentic to me. I still have the origional discs for both games. I think I had to patch them to run them on win 7. Now I have win 10 but haven't tried. I think I'll probably work on getting sw rebellion to work first. That game is old but loads of fun.